Danny teases me often that I get crushes on different gluten-free flours. He’s right, of course. I go through swoony phases with raw buckwheat, sweet white sorgum, or brown sweet rice flour. But my enduring love, the one that has been there since the beginning of my gluten-free life, is teff. Have you ever tried teff? Most of you will have eaten it in Ethiopian restaurants, in the form of injera bread. Injera is the spongy soft flatbread upon which all the delicious lentils or lamb or kitfo dishes sit for the communal meal. Oh, how I love a meal at an Ethiopian restaurant. Teff is the traditional grain of Ethiopia, grown there and Eritrea for thousands of years. It’s full of protein and iron, grows in difficult growing conditions such as intense heat and drought, and only requires 1 pound of seed to grown 1 ton of grain in 12 weeks. It’s a miracle plant, really. Teff was introduced to the United States by a man named Wayne Carlson, who brought teff seeds and the knowledge of how to grow them back to his native Idaho after spending time as an aid worker in Ethiopia. The Teff Company has been growing teff and ivory teff grains for over 30 years now. We’re happy to work with them as our latest sponsor. We really think you should know more about teff. And here’s a little secret: the dark teff grain has a faint chocolate-molasses taste. Whenever I bake something with chocolate in it, I use some teff flour. (Teff flour is the secret to the chocolate chip cookies with hazelnuts in our latest cookbook. You want to buy the cookbook just for that recipe.) I guarantee you this: ten years from now, every pastry chef in America will be playing with teff flour for their creations. You should be playing with it too. How did The Teff Company begin? Wayne Carlson started The Teff Company in Idaho nearly 30 years ago with the idea that parts of an ancient and very reliable ecosystem could be reunited. He believed that long surviving cultures are not just groups of people with ideas about sustaining themselves, but extend to an eco-culture that also includes their crops, livestock, and land. For thousands of years in Ethiopia an indigenous grass named teff has been an important part of local eco-culture, helping to sustain both the human and cattle population, while they in turn helped it to spread and adapt to new regions. Unfortunately, modern political and social events have caused some of the Ethiopians and Eritreans to become separated from this eco-culture, and end up in far flung places, such as here in America. While these refugees can adapt to their new lives, they often live with a longing for things that remind them of home. Wayne realized that they would be eager to re-establish their link with teff, and thus their homeland. He hoped that the restored link would allow the rest of us to see the value of this ancient grain and that it could be a nutritious and sustaining addition to our own lives. What do you wish more people knew about teff? Teff represents a great treasure brought to us by an ancient culture, members of which now share their lives with us in America. It shows that value can be found in a crop beyond its yield, in grain beyond its caloric content or nutrition, and in a meal beyond its taste. Whats your favorite part of the work of running your company? There are many facets to the work done at The Teff Company, each of which is satisfying in itself. The most rewarding part of the business is when these facets come together. As teff is still a relatively new crop to American agriculture, we are afforded the opportunity to work closely with many farmers, helping them to learn about raising teff, and the useful role it can play in their crop rotations. Farmers returning year after year demonstrate that teff can truly find an important role, even in our world of modern agriculture. Providing teff to Ethiopian and Eritrean customers, who are always joyful to have found a small part of their lost eco-culture available in their new home, has made everyone at The Teff Company many new friends. It has also taught us a great deal about an interesting and unique culture. Talking to someone who has only just rediscovered this much loved part of their former life will surely never grow old. Introducing this wonderful grain to the uninitiated American population adds an entirely different perspective to our experience. The interest in teff may be to simply satisfy ones curiosity about new foods, or to help one reform his/her diet and lifestyle. Whatever the interest, we are given the opportunity to pass on, not only the great benefits that teff can provide, but also introduce people to a whole new culture. All these aspects combine to make for a meaningful and rewarding business that we feel is worth our daily hard work. Since the founding of The Teff Company we have worked to introduce teff to as many people as possible. To see it helping people improve their health and expand their culinary horizons is truly gratifying. If you haven’t tried teff yet, we think you’re going to love it. So does The Teff Company. To introduce people to the wonders of teff, The Teff Company is offering our readers a special giveaway. I have used teff in some of my gluten-free baking through the years. I am from Idaho and was introduced to teff a few years ago. You have to get your proportions correct, because teff is a very dense flour, but it is extremely nutritional and worth adding! After eliminating gluten (and sugar!) from my diet for 3 months, I discovered that my fibromyalgia symptoms improved tremendously. Since then, I’m always looking for flours I can use so that I don’t have to give up home-baked treats. I’d love to try these products out! since going paleo i’m experimenting more and more in the kitchen and this sounds like an awesome way to start playing around with gluten free grains! I have also used it occasionally in my gluten-free baking, and have also cooked it up to eat as a breakfast porridge. It’s very good that way, and quite quick to cook, but I would really love to learn how to use it more in my baking because of how nutritional it is. I first used Teff with some pancakes, and then in your Chocolate bundt cake adapted from Joy the Baker. I had actually forgotten about it (out of sight, out of mind) so happy to have the reminder! Actually it was you/your blog that introduced me to teff several years ago. I saw it in a few recipes and did some research. I have baked with it on and off over the years, but it’s been a while! I love it especially in gluten-free bread! Just reading your post makes me want to use it again, especially in different varieties! I’ve used teff flour to make my own gluten-free sourdough starter. It has done extremely well while making injera. Soured teff really replicates that ‘glutenly’ sourdough taste. Teff AND sourdough? Intriguing! I love sourdough, and I often add teff to my baked goods and pancakes, but have never thought to make a starter from it. Do you make your starter from teff alone? Please reveal? Thanks! One of the first successful pancakes I made after finding out all my allergies is a teff based recipe. I love them with some nut butter, berries and maple syrup. Sadly, our Ethiopian restaurant puts a little (gluten) flour in their injera so I don’t eat it anymore. Good timing… I’ve never tried it, but I found a gf bread recipe this morning that uses teff as its main flour, so I was looking online today to see where I could get it from. This would be amazing to try! i’ve only had teff through injera at ethiopian restaurants, but look forward to trying it in my newly GF kitchen. Oh my goodness, this information is exciting! I haven’t used Teff before, only due to a lack of knowledge about it. It sounds just beautiful. I can’t wait to try it now! I get that jittery first crush feeling when I use a new gluten free grain (sorry boyfriend). I just got a handed down little flour mill that sounds like a lawn mower, and I shall run some teff grain through that, and make cranberry cacao nib biscotti! I would love to sample this grain. I am trying to adapt recipes for a GF niece. After traveling with her last year and trying a GF treat for the first time, I realized how bad these things taste and that the options are limited. So began my quest to make sure she had a baked treat that she could enjoy. I have been experimenting with different flour combo’s but haven’t tried teff yet. I would love to have the sample kit to bake with. I am longing to try it, but living in NZ, it is incredibly expensive to buy many of these “exotic” flours. I have seen it in so many of your recipes, and would love to try it! Chocolate AAAAAND molasses???!!! A SERIOUSLY? Need I say more? Like… uh… woah!! I am yet to use teff but now I’m SO looking forward to it! I’m new to this gluten free living (autoimmune disease) . After working through the initial shock at the depth of change i was in for, i began arming myself with knowledge…and, thanks to gfg, creativity! I am eating more creatively than I ever have before and am finding joy in what I’m gaining rather than staying in depression over what I’m losing. The experiments and discoveries of those who have traveled this road before (like gluten free girl, the chefs, and apparently many generations of Ethiopians! Who knew? 😉 ) are making the journey one of hope. My fears are falling behind. Thank you for sharing your story and excitement for the goodness (and artistry!) Food was meant to bring to our lives! Oh, Shauna, I could’t agree more! I work at the bakery with sorghum, quinoa, millet, rice, buckwheat, almond, hazelnut, chesnut and teff. And teff is my baby, is the one I absolutely adore. This is a superfood indeed, we would survive just on it. To make baked goods that are this nutritious makes me get up every morning excited to spend another 12-14 hour day working. Teff is so much fun to work with – it works well in many baked goods and making injera at home is a fun project too! I have never tried or even heard of Teff flour; so I am curious to experiment with it! I want to try it because I know the power of a healthy diet and I hope to continue to discover the benefits of maintaining a healthy lifestyle. I also want to cook with it so I can ‘surprise’ my husband into learning that healthy can equal tasty! I have recently been experimenting with different types of grains because my mom went gluten free and I’ve been hoping to find recipes that the entire family will eat but that she can enjoy too. My best experiences, including gluten free graham crackers and oreos, were with teff flour. I would love the opportunity to work with it some more! I’ve used the teff grain to make a delicious chocolate pudding, and I just recently tried Ethiopian food with real injera. Unfortunately, many of the Ethiopian restaurants near us add wheat flour to their injera. Love that Teff flour! While Ethiopian food is some of my favorite, I have never experimented with teff flour myself. I would love to try! You won my heart when you added the” faint chocolate molasses taste.” Anything that has that, I’d like to try. I never used teff — but would love to try it! Good luck on your book release today! I’ve never used Teff before, but would love to try it in my own baking mixes! I’ve been haunting your blog the past few months, with the idea that I might dip my toe into gluten-free cooking and eating. I’m not diagnosed anything, but I have gone through a series of tests to figure out why I have some unusual aches/pains… my chiropractor recently suggested I try gluten-free for a week… and I’ve been hemming and hawing on starting… I love baking. If I were to win this (no, I’ve never even heard of teff, though I have eaten once in an Ethiopian restaurant and know the bread you’re talking about), I think it would give me impetus to 1) buy your book and 2) try gluten free for a week (starting off with those chocolate chip hazelnut cookies!!!). I am always looking to expand into new foods. The upside of being gluten free is that I faced with all wonderful different foods that i have been used to. I’ve been reading your blog for years now because your writing is humble and genuine… now the relevancy of the content has hit me hard. I recently tested negative for Celiac however, after constantly getting sacked by allergies and sinus infections, I chose to omit gluten from my diet and am feeling great. Since going gluten-free, I still have the occasional flare-ups because I’m still learning and sometimes “slip.” What I miss most are baked goods, but I’m intimidated by the recipes. Since teff flour is what you’ve used from the beginning, maybe it’s what I should start with. I have never tried Teff. I am only a few months into living gluten free and enjoying the experimentation phase, I’d love an opportunity to try teff. I have never tried using teff flour but would love to experiment. I just had to stop eating gluten a few months ago for health reasons, and am still playing with many new (for me) ingredients. I also went to Ethiopia two years ago, ate injera all the time, and saw teff growing in rural areas! I have not tried teff. Currently, I am have begun a diet/lifestyle change to heal my metabolism. As a result I’m exploring foods I’ve never tried before. As a life long baker I am particularily interested in finding ways to create great baked goods without wheat. I will definitely try some of the Teff. Amazon tells me your new book should arrive here tomorrow, yeah! Thanks again for all of your research, ideas and encouragement. I have eaten injera a few times and tried to recreate it at home with poor results. I have tried numerous types of flours with no avail, and would love to try it with the “right” ingredients! Plus it would be a great addition to my newly gluten free kitchen! I love teff, too and it was one of my first gf flours. Love the color it brings to baked goods. But I had no idea there was more than one kind of teff! Would love to try these! I bought my first bag of teff flour to make your oreo cookies, which are wonderful. It’s become one of my favorite gluten free flours. I’ve seen so many lovely teff porridge recipes (honey & dates, mmmm) that I’d love to try. I think my only experience with teff so far is injera. That’d be a fun at-home project, too. I just bought my first bag of teff! I hope to make injera, but I also have a GF (as well as egg and dairy free) bread recipe I’d love to try with it. I have high hopes. I have no experience baking with teff but love Eritrean and Ethiopian food and injera. I would love to learn how to make it or know how to better cook with teff- Will you share some recipes? Thank you for the information on Teff flour. I have been gluten free for five years now but have never used it. I am also impressed with the farmer that is growing this in Idaho. It is people like this, making an effort to do something good and different that make the world a better place. Teff is something I haven’t worked with yet in my GF kitchen, though I’ve considered it several times. Before they all closed, I used to enjoy the injera made at our local Ethiopian restaurants. I love the ivory teff flour. I make injera at home with it and usually include some in my flour mixes. It also makes a wonderful faux pumpernickel bread. PS – Teff Company, if you’re listening, I would like to have the option of ordering a single 5-lb bag instead of being packaged in 5 1-lb bags. I have never cooked wth teff, but I would love to give it a try! I have been trying a variety of new flours in the past few years, and this one is still on my to-do list. I don’t have any experience with teff but soon hope that I will be baking gluten free and loving the new challenges and taste profiles this offers. Recently diagnosed with gluten intolerance that has caused a ripple effect of other issues, I went gluten-free “cold turkey” three weeks ago and can’t wait to start baking with alternative flours, but don’t really know where to start. I pre-ordered the cookbook and am anxiously awaiting its arrival. I’ve seen teff used in different recipes that I’ve found online and would welcome the chance to try the products in the sample pack to ease me into the new world of gf baking. Thank you!! I have tried making injera before with little success. I’d love to try again! I’ve used teff in crackers, as well as in a gluten free bread recipe. I need to be gluten free and teff works. Reminds me of pumpernickel when it’s baked – if I could just get that flavor! In fact, when I make the teff bread, I have to hide it or all the guys eat it up so fast I have to make it again! I also purchased a package of those funny little whole teff “balls” of grain that I haven’t used yet. I figure they could be whirred up into a flour, but would love to find out if there are recipes that call for the whole grain. Would be great to find more recipes that call for teff. Period. I also love an Ethiopian meal and remember first eating injera some 30 years ago when I lived in Chiago. Now, I live in small-town WI–and haven[‘t come across teff in my stories. I’d love to try it! I’ve never used teff before, but after I had the hankering for GF brownies, I came accross your recipe and looked it up. Would love to support a farmer like this too! I feel like part of Shauna–I had no idea how to cook, nor did my mother or anyone I knew. Now that I’m diagnosed celiac, I am opening to the world of taste. I’d like to try my hand at baking, but have no experience with teff. I can tell you a lot about how not to bake with other grains. That said–isn’t it amazing that there are all these wonderful grains to explore? My taste beds have been having quite an adventure! I think I need to pick up some teff flour soon, first to make your chocolate chip hazelnut cookies! They sound divine. I am also eager to try injera bread as well. However, there are no Ethiopian restaurants within a 4 hour radius of where I live, I will just have to whip up a batch myself. After hearing about teff right hear, I was very open to trying the teff tortillas that made natural foods market uses to make their gf sandwiches. Loved them! Now I buy them myself. I have yet to bake with it, but would love to find out just how lovely it is! Thank you for what you do for the gf community. I baked the brownies from your website using teff, and the taste was fantastic! There were hints of flavors I couldn’t describe – dark chocolate, coffee? It only took a small amount of teff to add something special to those brownies. I have not ever used it… But recently found out we need to go gluten free and so have been looking for alternatives. This would be great to try! I have been gluten free less than a year. We have been playing with a lot of different flours but have not tried teff yet. Wow, thanks for the great give away! I’ve used teff in a really simple savory pie crust. I have a raisin bread recipe that uses teff flour and it’s delicious. It’s from Alison Kramer’s book. I’d love to do more things with teff. Thanks for the generous give a way. I have no experience with teff but my dad recently was put on a gluten free diet so I’ve been trying to learn new ways of cooking his favorite foods. I have never used teff. in fact, this is the first time I have heard about this grain. I am always experimenting with new cuisines, and new ways to prepare my food. thank you so much for this blog and this amazing give-away. I would love to cook with these flours. We have only used teff in our pancakes, but would love to experiment with it further. Oh my god yes, teff is the very best. I’ve only ever used it in flour blends so far, but I think injera might be a fun baking project to try my hand at! I am completely new to gluten free cooking. My husband has suffered digestive issues for years and we have been gluten free for about 6 weeks. He feels like a different person but I feel like a fish out of water! I was very glad to find your website. I am very grateful that there are others that have paved the road for people like me to follow. Needless to say, I have sampled very few gluten free products. I have no experience with teff, but just last week was put on an anti-inflammatory, gluten-free diet. I would love to try it. Thanks for a great giveaway! I’ve never tried teff, but traditional foods from other cultures intrigue me and I would interested in trying it. Love teff and teff flour! Use it in breads, makes gluten free bread much more interesting. But the best thing I’ve tried it in is your brownie recipe, my new favorite and so quick and easy to throw together. Thanks for that one! I have a baked english muffin recipe which uses about 1/2 cup of teff – it’s so sweet and delicious. It’s also wonderful in banana bread, and whole teff is great as a replacement for oatmeal! Teff was one of the flours I used in my first successful baked goods after becoming GF. It’s a staple in my flour mix now. Fascinating! Yet another reason I need to try Ethiopian food soon! I have never had teff that I know of, and I’ve definitely never bought it, but I’m fascinated. Would love a chance to test it out! I have never used teff flour but I’m anxious to try it. I just added coconut flour and chick pea flour to my gluten free baking and teff flour should be a great addition! Injera. Speaking of which, we need to make Ethiopian food again soon! I have started using teff in the past year, as I was diagnosed with celiac two years ago, and have had to do a lot more baking! I used to have everything whole wheat, and I miss that weight that whole wheat gives to things. Teff is the best answer I’ve found to having baked good that have some substance to them, especially bread! I used teff flour once in muffins, and we loved it! I’ve also used the whole grain in a teff porridge – delicious!! I have never even heard of teff flour! I am relatively new to gluten-free baking, having just started the (modified) Wheat Belly diet about a month ago. I love to bake, but am trying to cut out carbs as well, so my baking is on hiatus for a while. It sounds like teff flour is a great alternative to all the other flours out there and I would love to try it ! I think that the store, where I have purchased Teff flour has gone out of business. The Inera at our local Resturant has wheat. They would serve me rice, but everyone else was dipping their bread into the shared dishes. Yeah, Amazon just e-mailed me that your new book has been shipped. My day is not complete until I have checked your blog. You feel like family. Love you and all you stand for. My Great Grand Daughter is eating Avacodo for her first food. I hope she grows up like your Lu. For the longest time, my favorite GF staple was teff “tortillas.” I was so sad when the one place that carried it stopped doing so. I used teff in pancakes and muffins for the first few years of being GF…but it got to be a pricey habit. 🙁 I miss it. I’m not going to lie, teff flour scares me! The color alone is intimating, so I would love some to try and make me a teff convert since I hear it is awesome to use in baking! I just used teff for the first time over the weekend, making the brownies with hazelnuts recipe you posted last year- so delicious! Sorry, my error. The bread book is by Jennifer Katzinger. She uses the teff flour in quite a few recipes. I have never tried Teff before, but as a newby to gluten free eating, I’ve been hearing about it everywhere. I love baking and your comment about the dark Teff flour has a chocolate-molasses flavor sold me! You say the word “chocolate” and I’m there. Thanks for the tip! Have never heard of Teff until I read the above post. Almost everyone in my family (5 of us) show some signs of gluten intolerance. I have tried many different flours in baking with some degree of success. I would love to try teff and being a farmer in Texas plan on doing even more research on this grain! I have only had teff in injera, but now that I’m eating gluten-free I’ve been interested in giving it a try at home. I love a mix of teff and almond flour for soft not-too-cakey brownies. I have tried teff before with making soft almond coconut cookies. Amazing texture for someone who doesn’t like hard, crispy cookies! Although I haven’t used teff flours, I have enjoyed the injera at an Ethiopian restaurant in Sacramento (although I didn’t know the ingredients). I learn so much from your site! Mille grazie for the giveaway! I need to expand my GF cooking beyond standard rice flours! I would love to try and experiment with Teff flours! So lookign forward to experimenting with teff flours now! We have a local GF Mom’s group here in Northwest Florida, and just this past week we were talking about teff and how we’d like to order some and experiment with it. Thanks for sharing what sounds like a great resource – and I did not know there were so many kinds of teff, so I just learned something! We love to use Teff in GF fruit crisps. Love to give teff flour a world in my favorite baking recipes! no experience with teff gf free flour as of yet and love the chance to try them. I love teff! It’s become a cornerstone to my glutenfree sourdough. My sourdough wouldn’t have its rich, nutty, slightly sweet flavor without teff. I’ve been amazed how well teff takes to souring a dough. I know I can keep my sourdough starter healthier by giving it a little teff whenever I feed it. It seems to attract those wonderful wild yeasts from the air more readily than other glutenfree flours. Yum. Now I can’t wait to try it in my glutenfree brownies. I adore using teff flour in my baked goods – especially the chocolate ones. I use it in my brownies most often. The taste and texture is wonderful! I have used teff a little in baking and would love to try it again. I haven’t gotten to try teff yet, but I’ve been drooling over your new cookbook. So if this is the secret to your cookies, then I’ve gotta get some teff!! I am new to gluten-free cooking and would love to try this grain, it’s something I have no experience with as yet! I’ve tried teff flour tortillas before, they were yummy and very pliable. I haven’t tried baking with it yet. I wonder if I could grow it in Northern CA? I’m growing chia this year. I want to try making injera! My dad grew up in Ethiopia but I was about 20 before I tried it for the first time and fell in looooove. I love teff! I haven’t baked with it myself, but I really enjoy the teff bread from New Cascadia, in Portland. It does have a delicious flavor. I would love to have some new floor to play with! I am so happy to hear about your excitement about your cookbook. I have never used teff and am always looking to try new things, especially a gluten free grain! We recently have gone gluten free and I’m really trying to find different varieties of flour that work for us. It would be great to try the teff and see how it works for us. I have not worked with teff, but i am always looking for ways to boost the nutritional content of the food that I make. I would love to make the injera. When I was in college, I worked in an Ethiopian restaurant and remember the bread. I’ve often thought it would be great to have when I am eating Indian food, but I had no clue that it was GF! Thank you for this very refreshing and informative website. My husband and I are about to begin our third week on a gluten-free, sugar-free, yeast-free – actually almost everything free – diet because of candida and other conditions. Teff just happens to be one of the grains that I want to try next. I have already been using coconut flour and almond flour and brown rice flour. I am looking forward to making my first flour blends with the help of your video. Thank you for what you and your husband do. (And by the way, I think your cookbook, which I hope to order soon, should be named “Gluten-free Girl and the Chef”. Danny isn’t just any chef, after all! we love teff. i didnt know about ivory teff??? we love your choc bana bread recipe! i use a bit of it often and its more resonable than almond flour! I love the flavor of teff, I’ve made cookies with it, it’s perfect for baking! I haven’t played with it in muffins or cakes yet, that might be fun to try next. I’ve never tried teff, but I’d love to! I use teff all the time in baking, both in flour form and the whole grain. Love the flavor it brings to breads and other baked goods. Can you enter from outside the U.S.? I do hope so, who wouldn’t love a grain with that much iron? I’d love to make those cookies and I’m sure my mother would love the whole grains (I can’t eat them myself). I’m sorry. I forgot to mention that this is for US customers only. Shoot! I was diagnosed with Celiac Disease about 6 months ago just as I was starting to bake again following the birth of my second child. I live to bake but am somewhat intimidated by the variety of flours needed for gluten free baking. I have heard wonderful things about teff flour and would like to try it in your cookie recipe. I haven’t had the pleasure of working with Teff yet, but your post makes it sounds just amazing. I would be interested in making some cookies, or maybe even some chocolate banana bread with it! After experimenting with the paleo diet, I am thrilled to be back on the grains and can’t wait to up my teff consumption!!! We’re just discovering some gluten intolerances, so I haven’t tried this yet, but it sounds delightful! I have never tried Teff, but my finance loves Ethiopian food and I have never had it, so what fun would it be to make it! I have a 4-year-old son with celiac… I am always looking for something new to try and would love to try teff. I have only heard of it, but never tried it. Have used the flour once, would love to try more and the whole grain as well! The more I learn, the more I believe that ancient cultures got a lot of things right. I’m also a grandmother of two and I am always looking for ways to bake healthy and treats for them. I haven’t tried Teff yet, but would love the opportunity! I love Teff, honestly. I use it all the time. I’m a vegan baker (no dairy, no eggs), and I think it has a perfect texture for vegan flour blends that need a different, more earthy texture. After using mostly the rice-tapioca-potato blends for ages, I added teff to try and make sandwich breads that were heartier, more nutrient-dense and fell in love. My hands-down favorite use is as one of the major ingredients in Russian black bread. My brother misses black bread immensely and would eat it almost every day, so every time I see him I bring teff and buckwheat flour and mix him up a dark, coffee-like rich loaf studded with caraway seeds and fennel. With the teff in the recipe, I can omit ingredients that aren’t part of his diet, like the cocoa, and still have a dark, rich loaf that tastes close to what his friends used to feed him. I haven’t tried making injera yet, but a sourdough flatbread sounds like a fun challenge to me. Teff definitely has a special place in my baking. It’s been over a year since removing gluten from my diet, and I have explored so many other food options out there and have been experimenting like crazy! I just discovered that I love buckwheat, and I was actually about to order teff from your sponsor’s website….I would love, love to win this and experiment more. I love teff and use it with buckwheat to give heft to flour blends with baking. Usually I use about 1/3-1/2 of the flour as a combo of the two with lighter flours and starches. Too much and my family turns up their noses, but chocolate is a great concealer. I also use it in a hot breakfast cereal with dried cranberries. I could not belive until I bought Teff and bake Injra .I did not know that they will sel Teff in THE USA. I love teff. It always adds a rich, hearty boost to my flour blends. I also live in Idaho and am quite in awe of the fact that it grows a mere 30 miles from my house. I would love to win and would put it to good use! I love baking with Teff, and thanks to what I’ve learned from Shauna about GF baking, I use it in recipes I adapt all the time. I also love Shauna’s Chocolate bundt cake made with Teff flour–delicious! Very excited about trying this great new source of flour and whole grains! Love Teff flour. I have been baking with it, making flatbreads with it, and using it as a porridge. I had no idea there was ivory teff, so now I am fascinated. I use teff as part of my gluten-free flour mix for a faux rye bread. Actually, we like it better than the memory of the real thing. I haven’t tried teff yet, but I really want to! I just haven’t been able to find it locally. claim them as their favorite waffle! I haven’t tried teff flour yet, but I really would like to! I have had friends telling me all about injera bread and that I must go to a certain nearby Ethiopian restaurant to try it. I contacted the restaurant, and, unfortunately, they mix their teff flour with wheat flour to create a more Westernized texture. I would love make some traditional injera bread! Also, I really like the new layout of your blog/website. I follow your blog with a reader, so today is the first time I’ve experienced your website in a while. Very nice and updated! I love using teff. My personal favorite is a teff and molasses gingerbread, dense, dark, and sweet, it is a real treat. I have no experience with teff but I love Ethiopian food and would enjoy trying to recreate it! I’ve never tried Teff, but it sounds amazing! I’m new-ish to the gluten-free life, recently diagnosed – and ever so thankful to finally start feeling better. The nutritional content of teff sound amazing & I adore injera bread, so I would love to give it a try. Thank you for your helpful blog, it is a great resource for me. And of course, for your fabulous sponsors. I love injera bread, but have never actually baked with teff. My family is trying to move towards baking with alternative flours, so would love to try this out. Thanks for the giveaway. I’ve never heard of Teff but would love to try it! Thank you for introducing us to this company! I just checked out their website and want to prepare all those recipes there! I have used teff flour (substituting 1/2 cup for other gf flour) in my breads and like the results. I just ran across an article on spaetzle and I bet that would be delicious with teff. Thanks for all the information. I have never tried teff flour. I have seen it used in recipes on your blog; but haven’t seen it on the shelf of my Sprouts. My “carboholic-ness” took a big hit when I went gluten free a year ago. I crave breads that no rice flour concoction can satisfy! I would love to try teff in a sweet little boule someday. I’ve only had injera, years ago, have never worked with this grain but have been seeing teff everywhere in recipes lately. Have been eager to try it- great giveaway! I’ve never used Teff, but would love to try it. I have never used teff, but loved the taste of it in the injera bread that I sampled recently. I can’t wait to get my hands on some teff flour so I can try making my own injera and the chocolate chip cookies with hazelnuts from your cookbook. I made graham crackers with teff that were really delicious. My husband was diagnosed with celiac about two years ago, and the lovely owner of our local Ethiopian restaurant gave me some teff flour to play with. I love it in brownies and Dorie Greenspan’s cocoa ‘nana bread. I’ve never tried the whole grain or the ivory flour. I’ve used Teff in molasses cookies. Lately I’ve been on a kick with crepes. I want to try Teff with sweet crepes in place of buckwheat. Has anyone tried that? I’ve been meaning to try teff as I keep reading about it. I think that it’s about time that I actually do so! I’m probably like the 80th person to say this, but I am in love with Teff brownies. It’s one of those things where all my gluten eating friends routinely tell me “these are the best brownies I’ve ever had” – which is of course partly because they’re made with real dark chocolate and butter not from a box, but also thanks to the teff. I like to play off the nutty flavor of it and add hazelnuts or walnuts to really draw it out. Of course I love using it in other ways, including home made injera, and would use it even more if it were just a tad more affordable. experiment with it. My husband has IBS and I think this may be easier for him to digest. I would like to try teff, but it’s not available in any stores in my city. Love their peanut butter cookie recipe! Also use teff in my pancakes and English muffins. It gives a nice whole grain taste to gluten free baking. Ohhhh! I’d love to try teff!! Sign me up! I’ve wanted to try teff but it’s a little pricey so I haven’t yet. I would love the opportunity to win a sampling of the grains and flours. Hi there- I’ve never experienced teff before but I love baking and cooking. I am constantly looking for something new that’s gluten free that makes great baked goods and still has flavor (aren’t we all). Based on everything I’ve read and taking a look around http://www.teffco.com/about-us/ this sounds like the ticket and I want some ASAP so I can get started. Thank you for all the wonderful information and inspiration your blog brings to me on a regular basis, I absoultely love it! My son was recently diagnosed with celiac and I am a baker at heart. It’s killing me that I can’t bake all my usual things. Thanks for this opportunity! And thanks for blogging all your information, I have a lot of reading ahead of me. I ordered your new cook book too! Maybe I can find some new favorites for my son. I’ve had teff in many restaurants and friends’ homes but have never cooked with it myself. I’d be interested to try it! I am new to gluten free living as of the past week. For years I haven’t been able to eat nuts, corn, popcorn, seeds of any size or dairy either….Anything new and that has a hint of chocolate flavor too would rock my ever shrinking food world! Can’t wait to find and try Teff and the cookbook too! I love teff but teff flour was new to me. It’s in my flour blend and has a wonderful nutty flavor. Next time I make pasta I’m gonna try it there. I would love some more of it. I especially like teff roasted till it pops! I have yet to use teff as part of my GF flour supply (it’s harder to find than the others), but I have had injera! Shortly after discovering I was gluten-intolerant a few years ago, I was visiting some friends in Madison, WI (one of the few towns in this state where you can find high quality, authentic ethnic cuisine of any variety). I wanted to try something I had never had before but that would be safe for me. A tiny, hole-in-the-wall Ethiopian restaurant was exactly what I needed! My friends didn’t seem quite as enthusiastic, but they gave it a fair chance, and the injera and stew that was served with it was fantastic. I am newly gluten free and would love to try these. I am always looking for good alternatives to the usual rice flour, besides almond, hazelnut and coconut flour. This looks great! I too love LOVE Teff Flours 🙂 Whenever I make GF Brownies I use Teff. Also in some GF bread recipes too. I always have Teff on-hand in my pantry, for it is in a lot of flour mixtures we use. Thanks for writing about Teff!! I would love to try teff! Thank you! Shauna, my husband LOVES your books, your family, and unbelievably, gluten-free-food ! I have used teff in my waffles and pancakes, and we LOVE it! No Ethiopian restaurants in the wilds of Montana, unfortunately. I like it so much I add it to most of my gluten-free baking..it makes a rounded, nutty taste that is so much better than just the old boring wheat flour cake we used to eat. And promptly got sick from! Pecan meal and teff is a winning combo too. Thanks for telling us more about it. We love teff flour around here. We tried making injera which, even without any fermentation time, was delicious and a surprising hit. We also made teff banana bread from your website which my three-year-old loves. We’ve only used brown teff to date, but I’d be delighted to try a new kind of teff from your company! Our son not only has Celiac, but type 1 diabetes, and I am always on the lookout for more nutritious flours to use in my cooking. Teff is one I have wanted to try but am unable to locate it anywhere near where I live, and I have been hesitant to order in a case from Amazon since I have never used it. Your description of the chocolate/molasses combination has definitely peaked my interest, so I will need to try this soon! My husband loved Teff ever since we stopped at an Ethiopian restaurant on our celiac-friendly road trip to Florida from New Jersey. They used pure teff unlike other Ethiopian restaurants we’ve encountered. Since 50% of our family is Celiac it was a lifesaver. May 3rd is my husband’s birthday, so this would be a perfect birthday surprise! I use many gluten free flours, but not teff, and I’m not quite sure why that is. I love injera bread, but I think I’ll start with that cookie recipe in your new cookbook which I can’t wait to get my paws on. Thank you for the great info Shauna. I enjoyed the read about teff flour. I have heard about it before and when I read this article I went to our local grocery store that has an excellent health food bulk section. They did not have any teff flour. I have been gluten free for 2 years now and I have been on a journey to try new flours and create some recipes to substitute for some of my old baking recipes. I also became vegan 3 yrs. ago and being gluten free and vegan was a bit of a challenge at first, but I am gaining confidence in my baking. I would like to try a bread made with teff. So many breads with alternative flours fall apart. Very frustrating sandwich making for sure! Thanks for the info. about teff. I will ask my grocer if he can look into adding a teff supply to the bulk section. We’ve only used teff flour once, when we were quite new to the gluten-free experience. Would love to make it a part of our regular baking because of the nutritional value and taste! I used ivory teff flour just last week after a 2 year hiatus from it to make maple banana bread. Amazing texture and naturally sweetened… I may need to make more RIGHT NOW! I used teff in recommended GF flour mixes off this site when I went GF for lent last year. If I win this, I’m using it to learn to make injera, creeps, and possibly in GF crumpets for my neighbor. I’m wondering if it will be light enough to make the crumpets work. I’m too pregnant to get too into this project at the moment, but Amanda must have crumpets! It will happen! Never cooked with teff, and as far as I know never eaten it either, not having lived around any Ethiopian restaurants. I’d like to try the whole grain as a substitute for rice, actually. My husband has not been diagnosed with Celiac, but seems to do better with a lowered percentage of wheat in his diet (he refuses to give up bread, and altho after a couple years of experimenting, I can do wheat-free crackers, cake, even pizza crust pretty well, sandwich bread is still . . . let’s call it an unmet challenge). He also has oral allergy reactions to rice, which is difficult because it has been the base of many winter dinners for many years, and so many GF products (esp. pasta) rely so heavily on rice flour. I’m also looking at millet and quinoa as rice substitutes . . . I’ll get around to buying some teff, eventually, too – I appreciate knowing about this company (I’m one of those people who reads all the ads in beadwork and quilting mags, btw, I have no issues with bloggers having sponsors!) as our local health food store, altho good, isn’t the most complete in the world. I’ve never had the opportunity to bake with teff before, but with some cross-my-fingers-I-get-picked luck and your new cookbook, my family could well be eating teff chocolate chip cookie with hazelnuts in time for Mother’s Day. And that’s the ONLY reason I’d bake on my one “day off” from the kitchen! I’ve used teff occasionally in bread and brownies. It always makes a lovely texture and I should play with it more than I do. But I really miss Ethiopian food since I haven’t found a restaurant yet (in DC) that makes gluten-free injera. I love to eat at Queen of Sheba in Oklahoma City. It would be fun to try making injera. I need to cook with teff again soon. I used it to make your fabulous brownies and no one would have ever known that they were GF! Love teff flour and go through scads of it! My favorite way to use it – peanut butter chocolate chip cookies using a favorite recipe but sub in half teff flour and half of your all purpose mix for wheat flour. HEAVEN!! My students beg for them all the time! I also love it in banana bread and pancakes! Shauna I have not tried teff but I have heard a lot about it, and after trying garbanzo, bulgur, pecan, and somany other flours I would love an opportunity to try this out. I would like to try the samples because our family is trying to eat in a healthier way and going gluten free. I really love teff….it has been one of the great gluten free discoveries of the last 2 years and I always include it my flour blends for the taste and texture. Would love a chance to try these different varieties. I bought a bag of Bob’s Red Mill Teff flour and have used it as one ingredient in a couple different breads, but I’m not super familiar with it. I didn’t have good luck with storebought teff tortillas so I’m a little more reticent of it but I need to give it more of a chance! I really love how the teff makes baked goods very light. Though I am not gluten intolerant I am trying to add more diversity to my diet and teff really fits the bill. At the San Francisco Baking School, where I completed the Professional Bread and Pastry Program, we made teff croissants that were absolutely divine. The slight hint of nuttiness and deep flavor provided by the teff took the croissants to a whole different level. Reading this post has encouraged me to finally recreate these at home! I have never even heard of Teff but really, chocolate-molasses, it must be amazing! I am curious about trying Teff . I have heard you mention it before but have never tried it .. I have been Gluten free for just over a year and love exploring new favors and new foods . It keeps things interesting ! I’ve never used to teff but have been curious to try it in a few of my recipes. I’m gluten intolerant and I’m always trying to find new grains to use in my cooking that will please mine, and my family’s, palate. I have a bag of teff in the freezer I’ve been too afraid to use to make real fermented injera. Otherwise, just a dash here and there in recipes. I should just take the plunge – injera this weekend! I have purchased Teff grain and flour from the Teff Company for a few years now. I love, love, LOVE teff! My favorite sandwich bread is made with teff, I add teff grain to buckwheat and steel cut oats when cooking hot cereal, and my favorite whole grain waffle recipe from nourishing meals is made with teff. I could make everything with teff and never grow tired of it. I’ve never tried Teff, but I love trying new GF recipes, and would love to incorporate this flour! My child has recently been diagnosed with Celiac Disease and so I am experimenting with Gluten Free baking. I would be thrilled to win this! 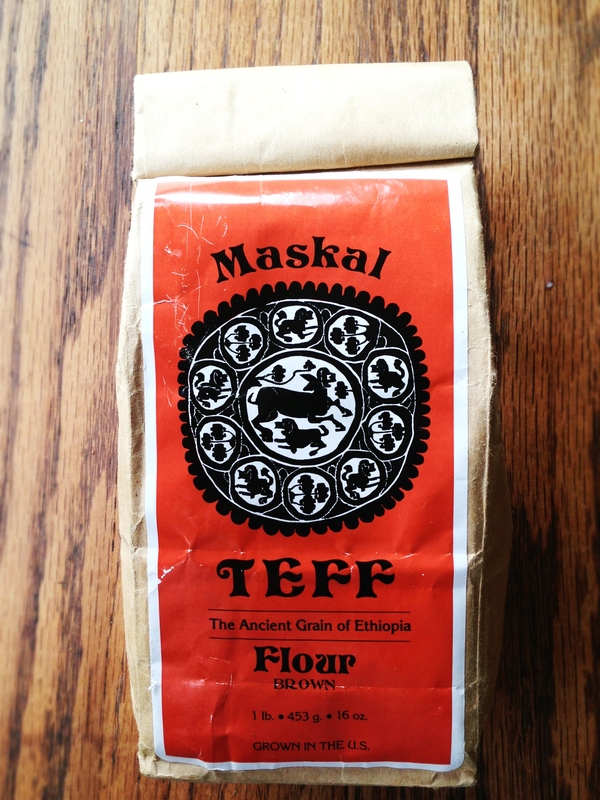 Until this post I’d never heard of teff flour, but I’ve consumed it! I have a good friend who is Eritrean and had the good fortune of eating her mother’s leftover cooking — including injera. So delicious! I’m definitely intrigued about other ways to use teff — the nutrition stats and sustainability sound great. Hint of chocolate and molasses?!?! Sounds like something to check out! Looking forward to my new cookbook arriving soon…along with the recipe for the cookies! I discovered teff about 2 years ago, I love using the grains to make a porridge topped with maple syrup and fresh fruit and using it to thicken soups and stews. Haven’t tried making injera but would love to try sometime. Teff rocks. Thank you for introducing me to it! I’ve never experimented with Teff! I would love to win some. I have to find an Ethiopian restaurant too and try injera bread. Since going vegan and gfree I purchased a gluten free vegan Ethiopian cook book. I am SO EXCITED! however I have not been able to find gfree Teff flour here and would be grateful for the opportunity to jump start my Teff experience! Wow, what a cool giveaway! I’ve never tried teff flour, but have been having fun experimenting with other flours over the last few months since I went gluten-free. Would love to try some!! eat gluten free and I would love to try the pocket bread and other recipes with the teff flours!! Ethiopian food in West Philly – so spicy, so good. I would love to make something with teff. I’d love to try the Teff flour. The flavors would add a lot of complexity to regular bread. I’ll look for it when I can go to Nashville next. I buy teff bread from New Cascadia bakery in Portland, Or and it’s wonderful. I would like to try the teff grain to make hot cereal, but it’s not easy to find – many stores carry the flour, but not the grain. I haven’t tried teff yet, but would love to. Even after 20+ years of gluten free eating, I am still learning so much about what my body thrives on! I have never used it, but its been on my wishlist for some time. Unfortunately, it is not sold locally and I haven’t taken the time to purchase it online. I actually heard about it as a gluten free option and then later as we began the adoption process (we are currently waiting for a referrel to adopt an Ethiopian sibling group.) Wanna try this! I’ve never cooked with teff flour before, but I love eating Ethiopian food! I would love to experiment with this grain at home, especially as I’ve recently given up gluten to see if my health and energy improves. Thanks for all the information! When I started using teff in my Gluten-free baking, I discovered it had a wonderful, subtle sweetness to it. This natural sweetness lets me cut back on sugar. I have a wonderful breakfast muffin, high in protein, fiber and some healthy fats and this lovely grain makes it even healthier! After every grain was taken out of my daughters diet teff remained. She bakes muffins with teff, cocoanut flour,chia, psyllium, bananas, apples etc., no sweetener necessary. Yum! My current favorites are almond and coconut flours but your story and the history have intrigued me and I would love to get the samples and participate in teff’s rich history! Thanks for sharing. When I went GF it was such a wonderful life change. I haven’t done any GF baking yet and would love to try these. I met Wayne at a gluten-free conference more than ten years ago, so happy to hear the company is thriving. He told me at that time that the injera made in North America all has wheat in it, which was a big disappointment at the time, but it sounds like things may have changed? Regardless, I always have a bag of teff in my pantry to include in my GF mixes, love the “whole wheat” look it gives to the flour. i love teff too! it’s my favorite flour to make brownies with. I love injera! I have recently gone gluten free, and am so excited to add teff to my long list of new flours to try (currently obsessed with buckwheat). Yum! I’ve used teff in the past to make my own injera. It wasn’t a success so I would love a new stash to try again! I’m interested in Teff but haven’t tried it. I don’t like to use mixes; too much stuff that’s processed and I really don’t think I need to eat a cup of corn starch. I either use my flours individually or mix them myself, so I’d love to try this and see how it works with the way I cook. Thanks for your posts – I really enjoy them! I’ve never tried teff grain or flour, but it would be something new and interesting that could provide another gluten-free item for our repertoire! This is actually the first time I have heard of teff flour, but as a recent explorer of various flours (buckwheat, einkorn, spelt), I would LOVE to try it! I have never used Teff flour, but would love to try it as I have recently gone gluten free and dairy free (due to lactose intolerance). Wow. I never cease learning from you. My husband and I love Ethiopian food, which we began sharing as soon as we met. We had a long distance relationship for the first year, flying back and forth between DC and Atlanta, both of which are homes to small but flourishing Ethiopian communities. My husband has been pushing for us to cut gluten for awhile now; he hasn’t been tested, but he says he feels so much better when he cuts it out. We came together over a love of food, and I think exploring teff flour together would be the best way to spend a weekend in our first house, on which we expect to close mid-June! I’ve only ever tried teff the one time I ate at an Ethiopian restaurant in high school (20 yrs ago). I didn’t realize it was gluten-free. I’ll have to add it to my flours soon. Thanks for the giveaway. I have no experience with Teff … but after reading this post I want to! It sounds really wonderful and I am always interested in trying new and different products in my kitchen and cooking. I’m a food collector. lol. I’ve only had teff in injera bread. Mama Desta’s Red Sea was a favorite restaurant when I lived in Chicago. I’m gluten-free, and have used almond meal almost exclusively in my baking ala Elana’s pantry. It’s very healthy, but very calorie dense, and am ready to branch out into using other gluten free flours. Fascinated with the description of the chocolate notes to teff flour, and can’t wait to try the cookie recipe. I use some teff flour in all my muffin and quick bread recipes–it adds moistness, texture, and density that most gluten-free flours do not have. It is the secret ingredient that makes my gluten-free pumpkin bread better than the “regular” version. I have never tried Teff and I’m so sad about it! I’ve become very interested in pseudo-grains like quinoa and amaranth, and teff would fit right it! Quinoa flour is one of my favorite flour to bake with, and I hope teff will be the same. All of the most tempting recipes that I am finding seem to contain teff–I’ve got to get my hands on some! Teff is my very favorite breakfast porridge, stewed slowly and made sweet with chopped dates. But I’ve yet to incorporate it into my baking regime, I’d love to try! I add teff flour to everything I bake- I love the texture!!!! Teff is one of my al time favorite flours! Its the secret ingredient in my bread, which tastes as close to real bread as anything I’ve tried since going gf. I learned about Teff when I went gluten free and I love love love it in peanut butter cookies! I haven’t had the chance to try ivory teff yet and am very curious about it. I am newly diagnosed Celiac and have only begun experimenting with GF baking! Teff sounds lovely, where can I find it?? PS can’t wait to try that cookie recipe out! I love teff. I also love injera only I have never successfully recreated what I have had in restaurants. Unfortunately most of the Ethiopian restaurants make their injera with wheat flour as well, thus it is no longer gluten free. I would love if anyone has a successful recipe for injera. I can never get it to ferment…. maybe the bay area is just not hot enough! I am brand new to gluten-free and, after a disastrous result using coconut flour in a cookie recipe, have been reading up on Gluten-Free Girl’s guide to flour (and what an education it has been!). I would like to find a way to make my mother’s Slovenian Potica recipe without the gluten, and your Teff Flour sounds very intriguing. I’d love to give it a try! I would love to try this flour! I have a passion for baking, but my boyfriend just learned he need to be gluten-free, so now, our entire world of food and baking must change. I just ordered Gluten Free Girl every day and would love to see how she uses teff flour in her book and try it out for myself! I haven’t made anything with teff flour, but I love soaking teff overnight and then making a breakfast porridge with lots of butter and a little molasses. I am having fun cooking/baking with gluten free flours and can’t wait to bake more with teff. I am all for anything that makes cookies taste good. I tried teff grains once but could not figure out how to cook them so they weren’t gritty. I think I definitely need to try the flour. I have never worked with Teff, but I’m excited to try! I’m just at the beginning of my gluten-free journey after reading that cutting gluten out of my diet might help ease symptoms of PCOS. I’m only on day 3 and I am just dying for a piece of bread! But I know I’ll find alternatives and I’m hopeful that gluten-free living will help me reduce the medications I take and improve my health. I had never heard of teff before finding your blog last year. I have been gluten free for five years now. I began experimenting with gluten free baking so that my children will not miss out on the joy of making and eating delicious baked treats. Your blog opened up a new world for me! I have learned so much and grown so much as a baker. One of the very first recipes I tried from your site was the teff brownies (to say I adore brownies would be an understatement). I purchased teff for the first time just so I could make those brownies. And, oh, are those brownies divine!! I immediately became a teff convert for life. It has become a staple in my baking arsenal. Thank you for introducing me to teff and for opening up my gf world! I just started using Teff this year. I agree, it tastes chocolatey! I have never used teff and I don’t think I have had it either. I really want to try injera bread, have heard so much about it! I love teff for GF baking. The “Not Rye” bread from Healthy Bread in 5 minutes a day uses teff, and it gives it a wonderful texture. I also love that it’s so nutritious. When I went gluten-free, one of the things I missed most was spelt cereal. Just whole spelt, given a steel-cut-oats grind in the Vita-Mix, and cooked into a creamy porridge with water and a pinch of salt. No gluten-free grain could give me that. Until I discovered teff. Skip the grinding and cook teff with water and a pinch of salt – it tastes like spelt, but it’s safe for me to eat. Then there are carrot-pear muffins, made with teff flour – such an unassuming name for such delectable muffins. Yes, teff takes gluten-free to a whole new level. Our entire family (of 6) loves teff! We haven’t made many different things with it simply bc the few we have made are so popular-waffles and porridge. It is difficult to find here in NH though, and shipping can make it rather pricey, so it is a rare treat. I’ve had no experience cooking with teff before, but I’d love to try it because I’ve been experimenting with wholesome baked goods (date sweetened key lime pie, and sweet vanilla bean frosting) for my family and believe that flavorful ingredients contribute so much to a dish! I’d love to make a teff spice cake for my father and attempt injera for family dinner! If its not too much to ask, would you be able to do a post on your favourite flour substitutes to use? As someone who can’t eat gluten I was really excited to try Teff after seeing your post, but then quickly found out you can’t import it into my country (Australia) since we have a pretty delicate ecosystem. Perhaps I could find some other good substitutes that actually taste alright that you know of. I am slowly going insane since this allergy only just developed a little over a year ago. Wait! I just saw your post on baking gluten free! Nevermind, I’m giddy from happiness seeing you have a few recommended things there. Thank you! My first GF purchase was some wraps made with teff flour. They were wonderful! Unfortunately the bakery that made them has closed without sharing the recipe with anyone. I would love to experiment a bit and make my own. I haven’t had Ethiopian food since becoming celiac over 8 years ago. Who knew? maybe I will try it again. I would love to try Teff flour. I have heard of it but haven’t tried it. I am also allergic to corn and sorghum so other options are always good. I use nut flours, coconut and the “basic” ones that we have available. I love to bake as does my daughter-in-law so this would be a good thing to try. We are all celiac, and even though my grandson is not celiac at 4, he has both of the genes so we are careful how much gluten he gets. I use teff flour weekly when I bake my gf brown bread. It is delicious! As Shauna pointed out, I, too, also use it in any gf recipe that contains chocolate. Yummy. Unfortunately, I still have not found an Ethiopian restaurant near me that uses exclusively teff in its injera, so it isn’t gf. Boo. would love to win this giveaway. Love trying new gluten free flour combos while feeding my gluten free wife! My son, 20 years ago, was diagnosed with severe food allergies. I cooked with milk, cheese and gluten in everything. I did not know how to cook without those, and had to teach myself to cook all over again. I went to grocery stores and picked up veggies, fruits and grains that I had no idea what they were let alone how to cook (or not) them. Teff was a failure for me – I did not like it (because I did not know what to do with it at all, and not being able to add milk or cheese or the other things I was used to to change the taste frustrated me). I am new to being gluten free now, and want to try it again – I heard it can beef up a flour blend, be cooked like a porridge, and many other things. I would love to have the freedom of 2 lbs of grain and 2 lbs of flour to experiment with. Love teff flour in graham crackers, so delicious! Also teff pita pockets are scrumptious, really excited to check out your teff recipes and find something new to munch on. Teff is an amazing grain! I love the flavor it gives to apple muffins, quick breads, and crackers, just to name a few. I have only tried BRM Teff flour, and would love the chance to compare this product. Our favorite teff recipes are the “rye” bread from Healthy Bread in Five Minutes a Day and Almond, Teff Ginger Molasses cookies from Clean Foods. I like to use teff along with sorghum flour in my baked goods. We especially like it for banana pancakes! Teff makes the best brownies, although I would like to try the flour in a different manner w/o chocolate for my GF friends. I get my product bulk at local coops and am not sure of the producer, likely close here to the Twin Cities. Love working with teff. We enjoy a cooked teff breakfast porridge made overnight in the crockpot. We also enjoy using teff flour to make muffins. Thanks for the giveaway!!! I like teff in baking that isn’t as sweet, like in most of my atempts at making bread. I have’t thought to include it in chocolate-based recipes, I bet it would be good in the chocolate zucchini muffins I make. I also would love to try making teff porrige, just haven’t got around to buying the grain yet.